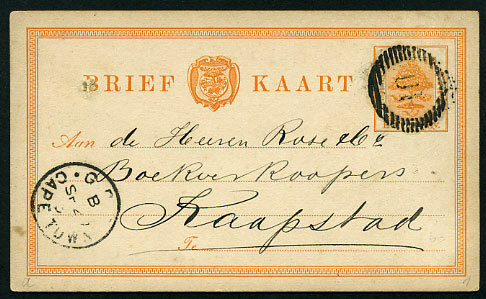 1884 use of 1d brownish-orange Brief Kaart pmk'd magenta ROUXVILLE W/MY 30 84 O.V.S. 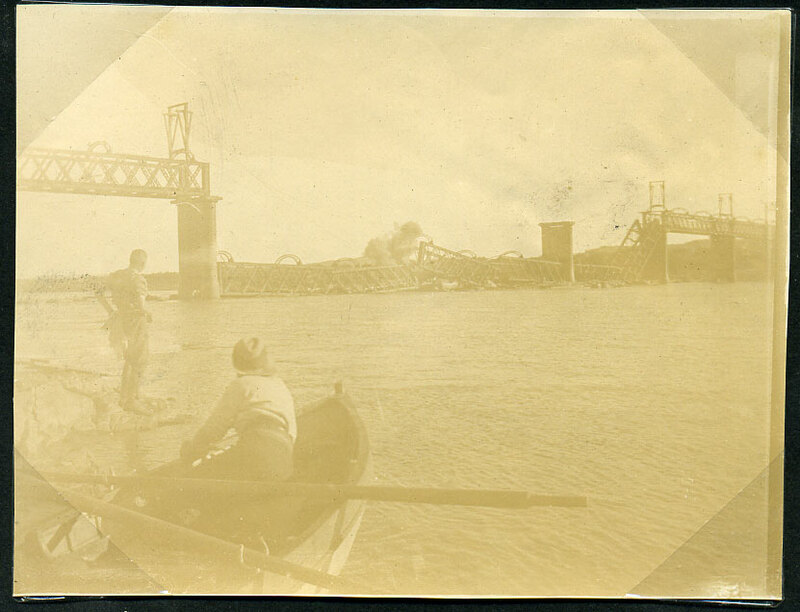 datestamp to Port Elizabeth, reverse headed "Commissie Drift Bridge, Rouxville" with A/JU 4 84 arrival, closed central spike hole. 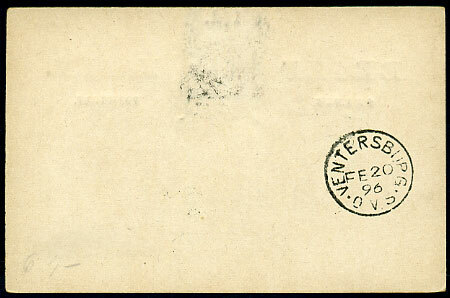 1892 "½d." 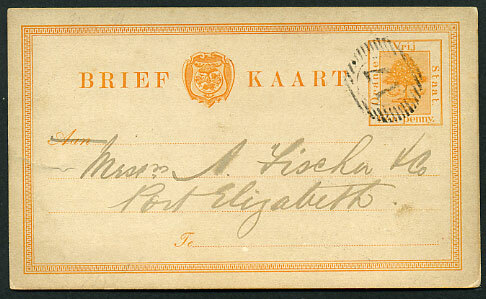 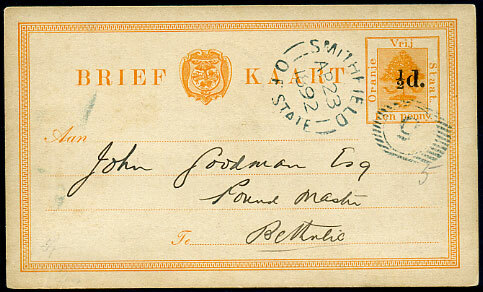 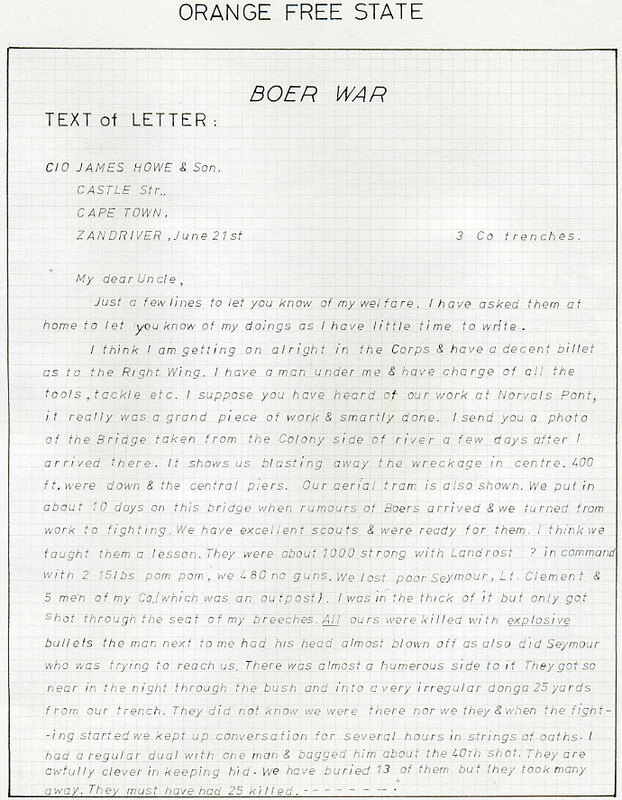 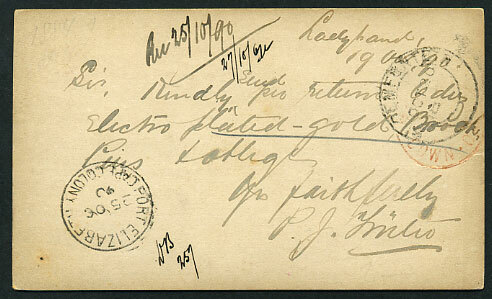 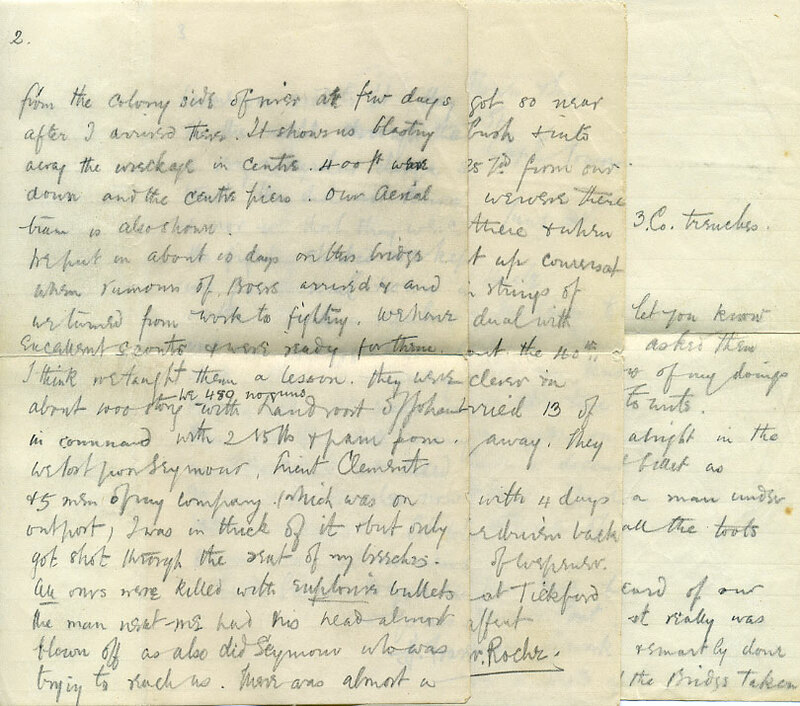 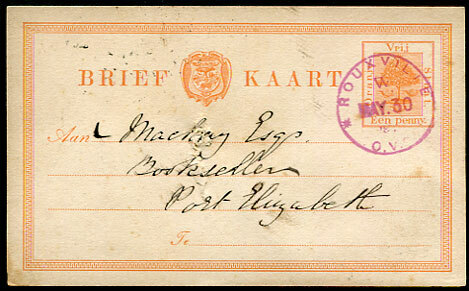 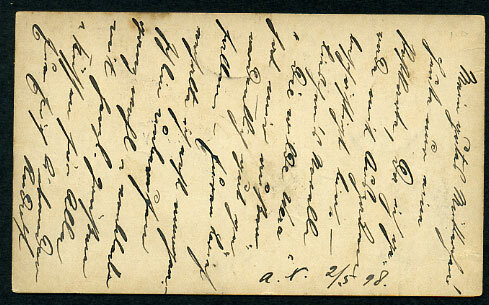 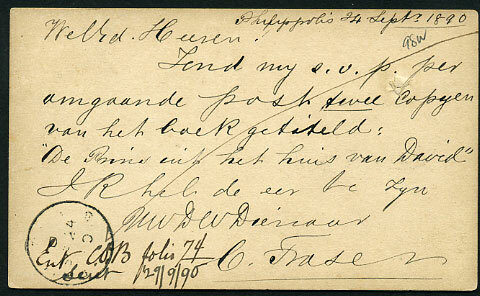 on 1d orange Brief Kaart to Bethulie pnk'd SMITHFIELD AP 23 1892, reverse full text and fine arrival cds. 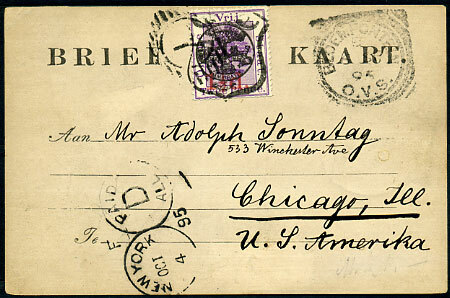 tying 1½d on 2d Brief Kaart to Chicago, reverse DEWETSDORP SP 5 95 despatch cds. 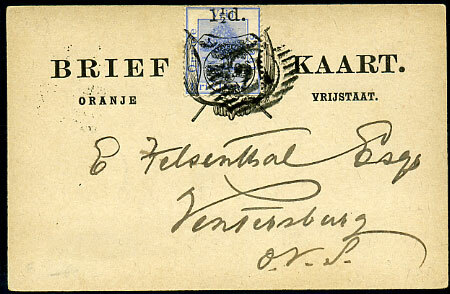 11 bar tying 1½d on 3d Brief Kaart within Ventersburg, reverse FE 20 96 cds. 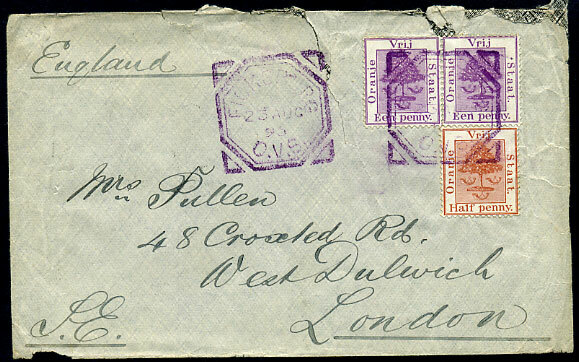 (SQC) in purple ink dated 23 AUG 95 tying ½d, pair 1d on cover to Dulwich, b/stamped red London SP 17 95 arrival, peripheral opening faults along top. 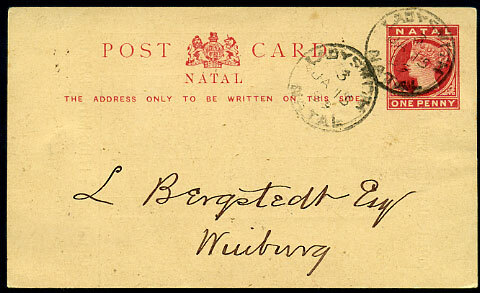 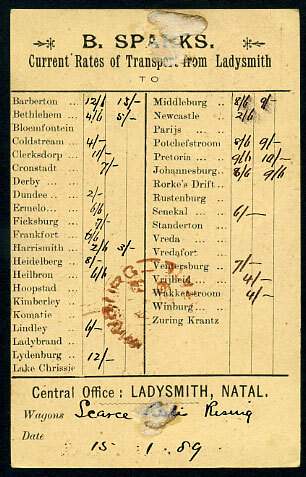 QV 1d Post Card dated 3/JA 15 89 to Winburg, reverse printed B. SPARKS transport rates from Ladysmith. 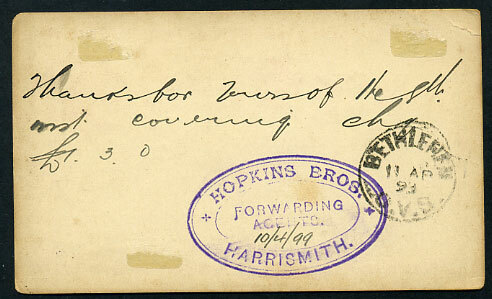 censored reg. 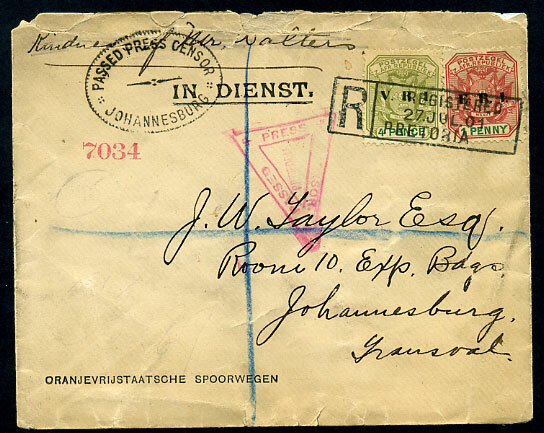 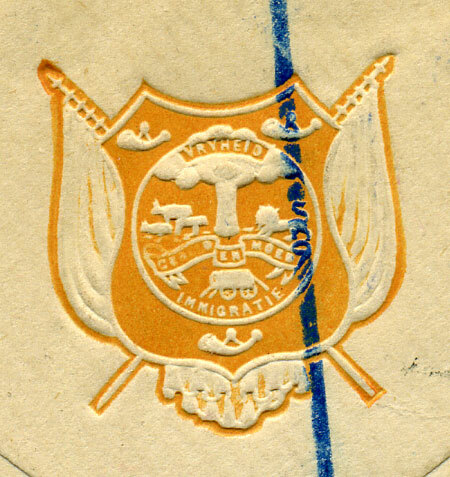 cover with Arms on flap with 1d, 4d tied boxed Pretoria reg. 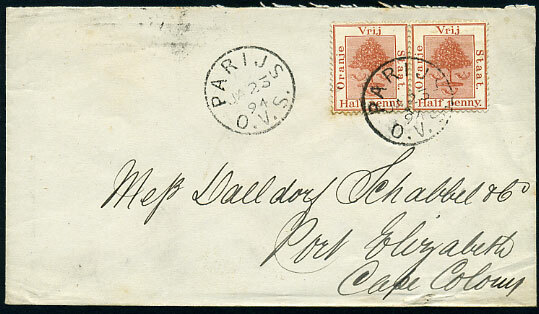 h/stamp dated 27 JUL 01, unkindly opened along top. 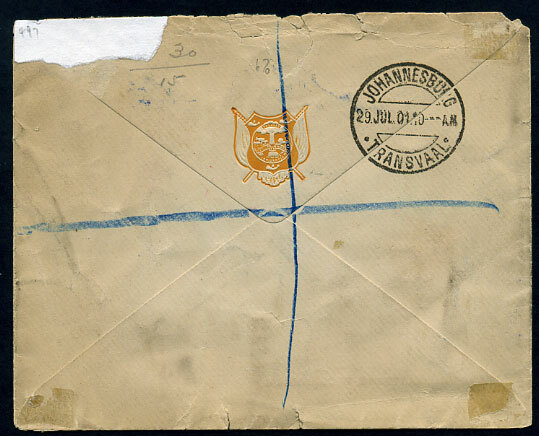 dated JA 23 94 on pair ½d cover to Port Elizabeth, b/stamped very fine strikes VREDEFORT JA 23 94 and MIDLAND DOWN JA 25 94 cds, slight toning around perfs. 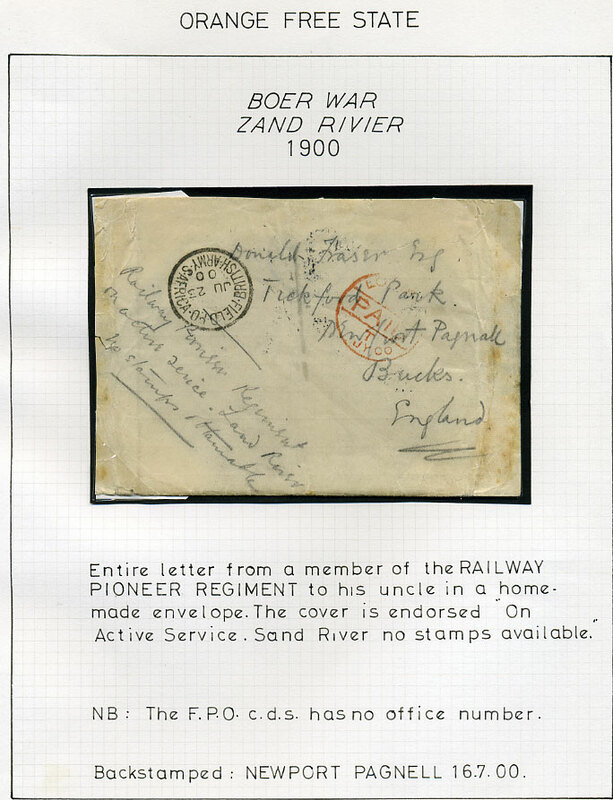 without despatch cds (contrary to regulations)tying design 1d orange Brief Kaart arriving Port Elizabeth 25 OC 90.
on 1d Brief Kaart written 24 Sept to Cape Town. 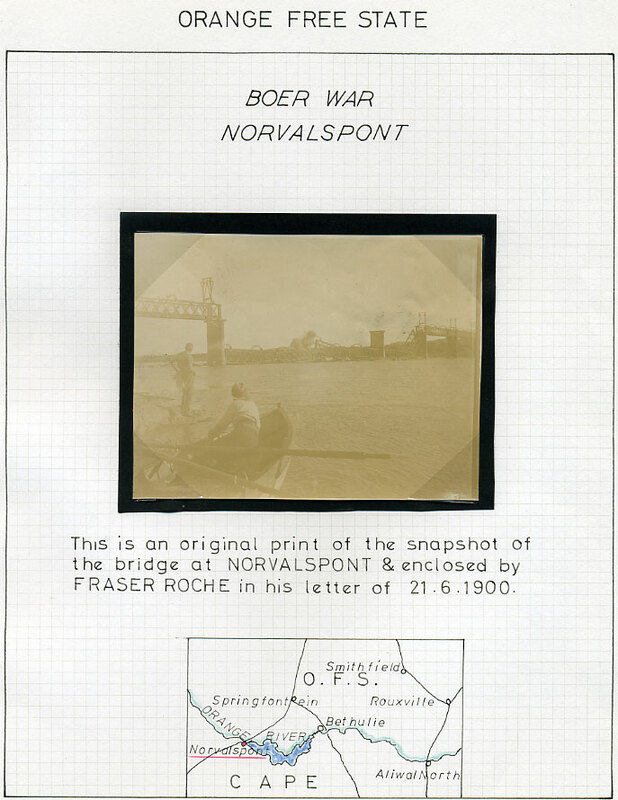 with original photo of the bridge at Norvalspont, the outer cover with some toning, tears, Newport Pagnell JY 16 00 arrival. 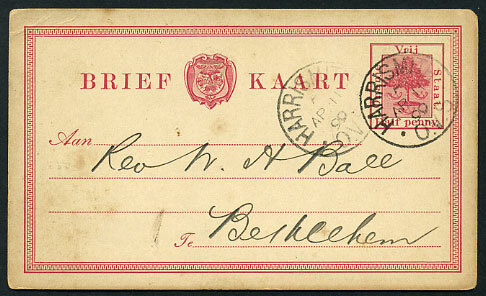 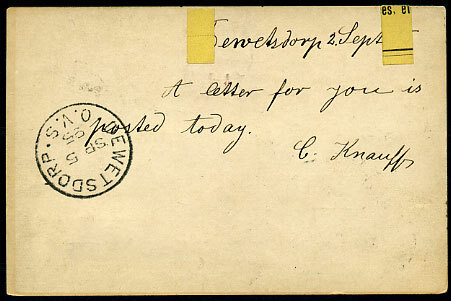 violet dbl-ring oval dated 10/4/99 used as senders cachet on ½d carmine Brief Kaart addressed Bethlehem, minor blemishes. 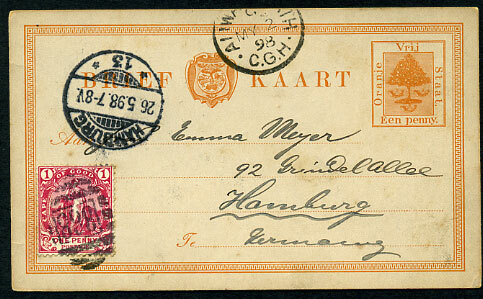 C/MY 2 98 with CGH 1d tied on uncancelled Orange Free State 1d orange Brief Kaart to Hamburg.